Gas heat only boilers, also sometimes known as open vent boilers, provide heat to radiators and a hot water cylinder. Hot water is heated over a period of time and then stored in a hot water cylinder for use when needed, unlike a combi boiler which heats water instantaneously. As a result heat only boilers generally require less power output than a combi; a typical heat only boiler will be 15-20kW output rather than a minimum of 24kW output for a combi. Heat only boilers are also generally simpler and lower priced than system boilers. A system boiler has additional components built into the unit whereas a heat only boiler relies on external components such as a pump to circulate water round the system. The choice between an heat only boiler or a system boiler is often driven by ease of installation. 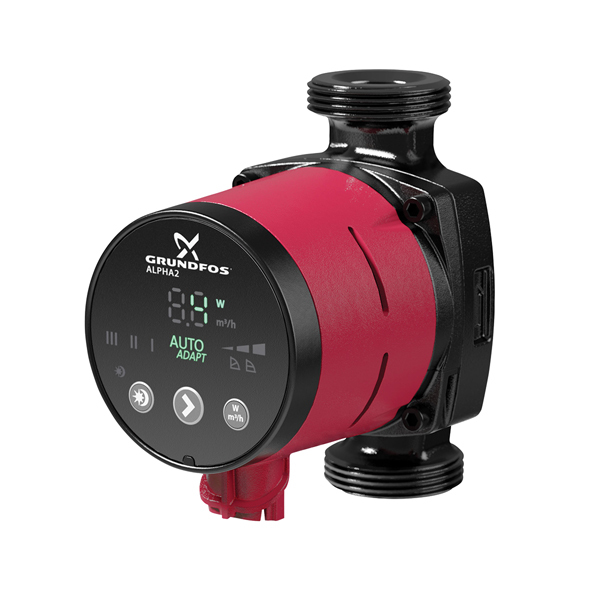 In an existing installation where the existing external components, such as the Grundfos pump shown in the photo, do not require replacement then a heat only boiler is a lower cost choice. System boilers have not been around so long so most existing installations will be using a heat only boiler. Where a totally new installation is being done then a system boiler may make more sense as the installer does not have to buy or install additional components. Below we list the popular heat only boiler options by power output in kW and then brand. Note that the prices are for the boiler only and do not include the flue. They are also typical prices and do not reflect any price promotions with a specific plumbers merchant or retailer. On occasions, manufacturers offer promotional packages which include the flue. See also prices for: System Boilers and Combi Boilers.